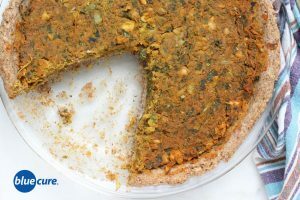 A savory “quiche” made with a creamy bean center and an almond based crust. This is a healthier, nutrient-dense alternative to standard quiches made with eggs and pastry crust. Mix and match the spices or try adding other veggies to give this quiche different flavors and textures. This is a great dish for breakfast, lunch, or dinner! Serve it with a side of fresh fruit or a green leafy veggie salad. Eggs and other animal-based foods, such as meat, dairy, and fish, are associated with increased cancer risk. The reason may be due to the production of TMAO. Incorporating more whole, plant-based foods, such as fruits, vegetables, whole grains, and beans, may be beneficial for prostate cancer prevention. Preheat the oven to 350F. In a bowl, combine the ground flaxseed, water, garlic powder, ground sage, and black pepper. Let it sit for 2-3 minutes. Blend the almonds into a flour, then stir in the almond flour into the flax mixture. Using the back of a spoon or clean hands, spread the dough in a pie pan so that it covers the bottom and edges. Bake the crust for 15 minutes. Combine all the filling ingredients in a food processor. Pulse together the ingredients, optional to keep some texture to the mixture. Add 1 Tablespoon of water if needed. Spread the filling evenly on the crust. Bake for 30 minutes uncovered. Enjoy!